The first ReadyBoost performance test was done on Windows 7 with a Core i3 550 3.2Ghz, 8 GB RAM and a Hitachi Deskstar 7K1000.C 320GB. A Corsair 16GB USB3 stick was used as cache, unfortunately the computer does not have a USB3 interface. The test was done by starting the following programs at the same time with a bat-script: Eclipse, Oracle Sql Developer, Paint.Net, Powershell, IE9, Chrome, 7-zip. 1. First reboot, to clear the disk cache. 2. Wait until the CPU and disk was around 0% load in resmon. 3. Run bat-file, record result. 4. Enabled Readyboost, and reboot again. 5. Wait until the CPU and disk was at 0% load, and Readyboost was done loading (Checking resmon). Note: ReadyBoost rebuilds after reboot! 6. Run bat-file, record result. 7. 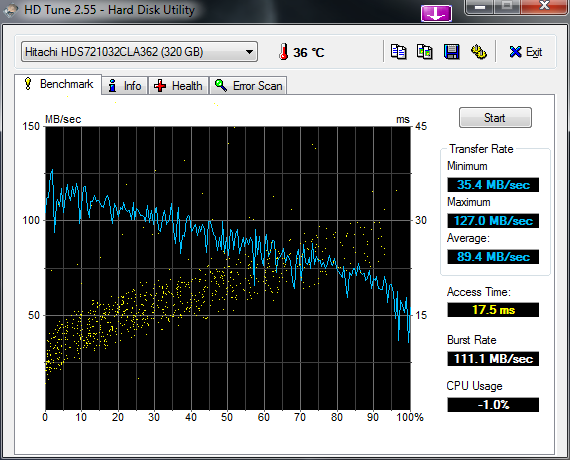 I then ran the test several times, but as can be seen above, disk cache kicks in after first load. I know I should have done this test several times, but the computer takes a long time to start up, due to the domain settings. Though the results are consistent with my subjective perception. The second ReadyBoost test was done on Windows 7 with an Athlon II X2 250 3 Ghz, 4 GB RAM and a Western Digital 5400 rpm drive. A Sandisk Contour 8GB USB2 stick was used as cache. This test started the following programs from a bat-file: VLC, IE9, Windows Media Player, Wordpad, Windows Fax & Scan, Powershell. This time I rebooted the PC before I ran each test. It takes some time to build up the Readyboost cache, so ReadyBoost is not useful for computers that are rebooted frequently, as it seems that Windows 7 tend to rebuild the cache after reboot. The right-most test shows that if the batfile is run before cache has been built, ReadyBoost is not active. For computers that are rarely rebooted, my conclusion is that ReadyBoost is very beneficial (non-SSD systems) - if the stuff you're loading is not already in the disk cache. If you have an SSD, Windows 7 will disable ReadyBoost by default as it is not needed. As can be seen below, the best choice for ReadyBoost of those I've measured with HD Tune is the Sandisk Extreme III 8 GB SD Card as it has the lowest read transfer times for 4kb read. For simplicity I used the average read speed and access times provided by HD Tune to draw the chart. 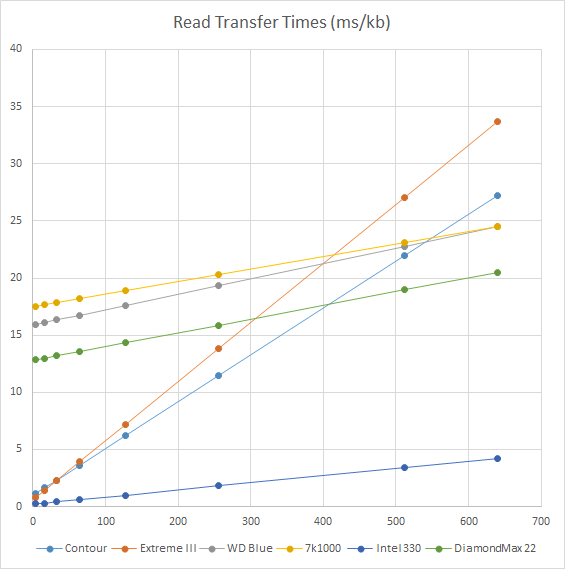 The Intel SSD is included to illustrate why ReadyBoost is irrelevant for systems with SSD drives.